I recently ran into a language security error with a custom Sitecore security domain and have detailed the fix in this post. I have also provided links to a couple of other helpful resources for setting up new custom security domains. 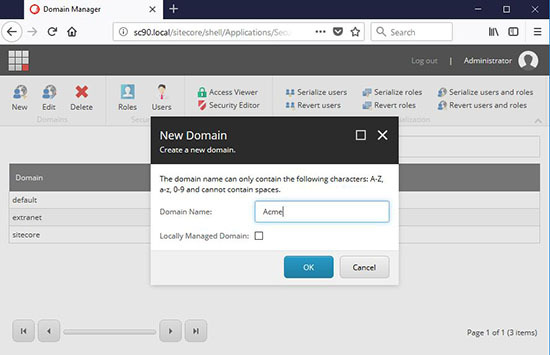 Sitecore custom security domain documentation can be found here and covers most steps needed for creating a new domain. The creation of a new domain triggers an update in the \App_Config\Security\Domains.config which will need to be propagated to all environments. Since this lives outside of the Sitecore node, you cannot patch new domains in with a Sitecore config override file but Kam Figy details a patch solution here. 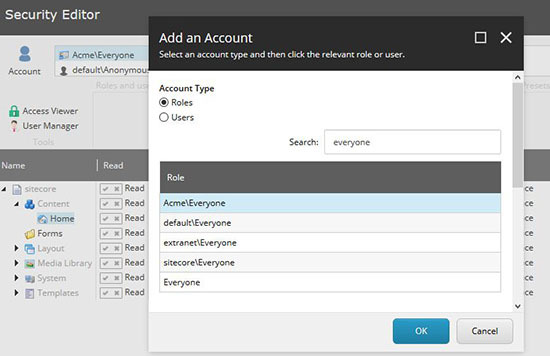 Every domain in Sitecore has a build in “Everyone” role. All users in the domain inherit from this role but it cannot be managed like a regular role. 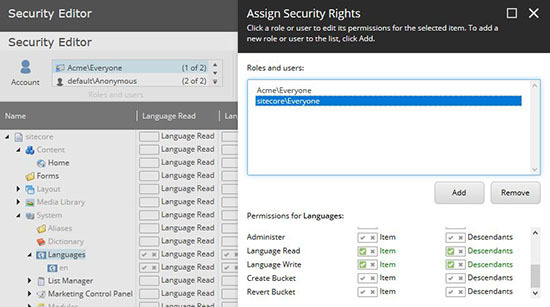 It is only accessible from the security editor so access can be assigned but not from the regular roles manager. When my new custom domain was created, an “Acme\Everyone” group was automatically created as expected. What was not expected is that this new role does not have language read and write access by default. To fix this, go to the security editor and search for the everyone account for your domain. Browse to the System/Languages folder and click Assign Security. You will notice that the sitecore\Everyone group has Language Read and Language Write access on this folder and descendants. Give your domain Everyone user the same access. Problem solved. Of note: this post refers to Sitecore 9 update 1. I’ve been perusing all of the super helpful blog posts around getting Sitecore 9 up and running locally. I started with Toby’s blog post on the prerequisites here followed by George’s installation post here. I did however run into a couple more gotchas that I hadn’t seen listed and couldn’t come up with a solution for by searching which I’ll detail here in the hopes that it saves someone some time and aggravation. When googling I found that a bunch of people had also run into this, however I didn’t see a solution. I finally figured out that I didn’t have our latest and greatest partner license and as soon as I replaced that, I was back in business and am now the proud new owner of a local Sitecore 9 site. The JRE version is critical – use JRE 8 (not JRE 10 – uninstall JRE 10 if you have it). And use SOLR 6.6.2 as it fixes a bug in 6.6.1. And Brandon Bruno has a ton of helpful tips up here.